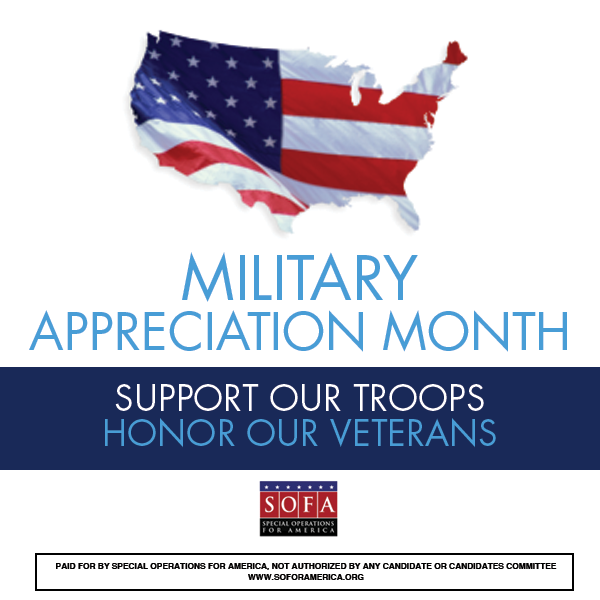 “Lee Zeldin has served his country honorably. The DCCC should be thanking Lee Zeldin for defending our freedoms, not attacking him as a coward. Whoever is responsible for this insult needs to apologize as it offends all of us who have worn the uniform,” said Gary Stubblefield, a former Navy SEAL and chairman of Special Operations for America (SOFA). Zeldin is a Republican member of the New York State Senate running for Congress in the 1st Congressional District. Zeldin spent four years with the U.S. Army. In 2006, while assigned to the Army’s 82nd Airborne Division, Zeldin was deployed to Iraq with fellow paratroopers in support of Operation Iraqi Freedom. We know there are more organizations that are out there so please share your favorite organization on Twitter & Facebook with the hashtag #SOFACares. 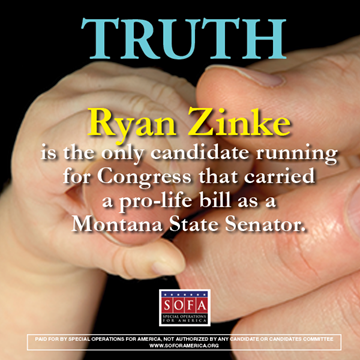 Truth: Ryan Zinke is the only candidate running for Congress that carried a pro-life bill as a Montana State Senator. 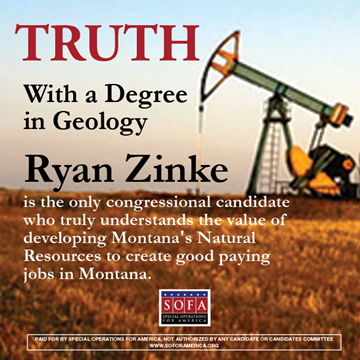 Truth: With a degree in Geology, Ryan Zinke is the only congressional candidate who truly understands the value of developing Montana's Natural Resources to create good paying jobs in Montana. 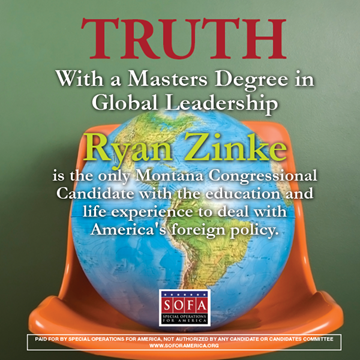 Truth: With a Masters Degree in Global Leadership, Ryan Zinke is the only Montana Congressional candidate with the education and life experience to deal with America's foreign policy.